You may be looking for the group or the Arrowgun. Speak with the Gullwings after the Battle of the 1000 Heartless. The Gull Wing is a Keychain for Sora's Keyblade that appears in Kingdom Hearts II. During the events at Radiant Garden, the Gullwings initially aid Maleficent as mercenaries, but once the Organization's Nobodies drive Maleficent away, the Gullwings are left without an ally or purpose. They take Sora's suggestion to help Leon protect the town, after Donald hints that Leon might have treasure to offer. When Sora, Donald, and Goofy later return to the castle of Hollow Bastion, they apologize for deceiving the Gullwings into helping Leon, who did not actually have treasure. Although the Gullwings originally planned to take all of Sora's treasure as payback, they tell Sora that they heard from Leon how hard his journey is, and offer him the treasure chest containing the Gull Wing instead. The Gull Wing's appearance takes after the trio of young women by the same name. Its Keychain is the symbol of the Zanarkand Abes, the blitzball team that Final Fantasy X's Tidus and Jecht belong to, which was then reused as part of Yuna's Gunner dressphere; the symbol itself is attached to the weapon by the wrapping of Yuna's long ponytail from Final Fantasy X-2. 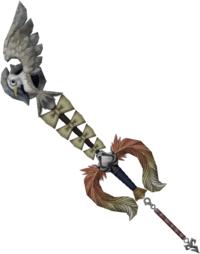 It is attached by a chain to the Keyblade's hilt, this resembling that of Paine's sword, particularly the spade design where the handle meets the blade (originally a spade-shaped skull in Final Fantasy X-2). The guard is made from two feathers that were once a part of Rikku's outfit in Final Fantasy X (tied to the end of the two braids protruding from the base of her hair), while the blade is made from the bows seen on the arms of her Thief dressphere from Final Fantasy X-2. 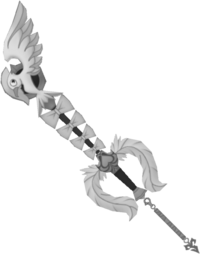 The teeth of the Keyblade is quite literally the wing of a gull, the mascot of the Gullwings sphere hunter group. The Gull Wing takes its name from the Gullwings, a group of sphere hunters that appear in Final Fantasy X-2, who are led by Yuna, Rikku, and Paine. The Gull Wing is one of the weakest Keyblades found in the game, having a strength bonus of only +3 and no magic enhancement, but it has Experience Boost as its attached ability, which enables Sora to gain increased experience if he has less than half of his total HP remaining. This page was last edited on 2 April 2019, at 00:43.